My daughter Elida and I went for a mini adventure and this is where we ended up. This is is one of her pictures. 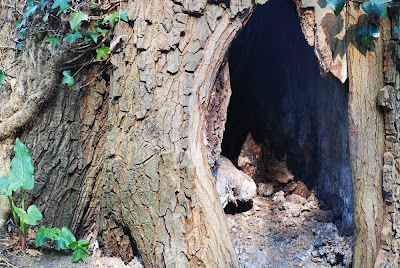 It is a hole at the bottom of a tree in a cul-de-sac in Lyminge...a bit like Alice in the Wonderland, isn't it? Wow, that is truly out of a fairy tale. I expect to see a glimpse of an elf or gnome.